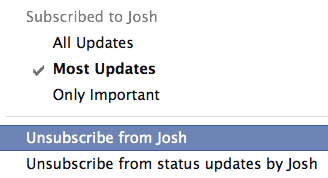 I have one major gripe with Facebook’s Subscribe feature: I have to publish to all my friends to reach my Subscribers. In September, Facebook launched Subscribe, its Twitter-esque option that lets people receive the public updates of other users without being their friends. But I don’t publish my articles to my Subscribers who want to read them because I don’t want to spam my friends who aren’t interested in tech news. This same issue is impacting a lot of journalists, public figures, and other content producers, and I believe it’s preventing wider adoption of the Subscribe feature. I did a feedback session with Facebook about Subscribe soon after it launched, and the company is well aware of the problem. I commend Facebook’s Subscribe team for building an otherwise useful and ambitious product, and for critically thinking about how to solve the issue without opening new spam opportunities. However, today Facebook announced that embeddable “Subscribe to me” buttons are on the way, and I think it needs a to decide on a fix first. Most public figures that permit Subscribers typically publish publicly about a relatively specific topic that isn’t necessarily of interest to their friends. Journalists about their beat, politicians about politics, technologists about technology. Even celebrities might want to share what they ate for breakfast with their subscribers, but not their friends. Unfortunately, Subscribe doesn’t support publishing of content category #3 right now. Instead Facebook functions too similarly to a broadcast channel like Twitter. That’s likely because it’s concerned that if it added a “Subscribers” publishing distribution option, it would allow spammers to relentlessly publish to their Subscribers without having to worry about losing friends. I argue that spammers don’t care if they lose friends and right now are just spamming both. Also, I believe the audience should be free to sort this out — if they’re being spammed, by a friend or someone they’re subscribed to, they should be trusted to dump that person. I don’t think B will work. Users would have to classify each of their friends as someone they do or don’t receive public updates from — a chore most wouldn’t undertake. Even then, just because an update is public doesn’t mean it’s necessarily content #3. It could be a general interest update that their friend might find interesting but isn’t something that needs to be kept private. If “Subscribers” was selected, an update would be public, but only be delivered to the news feeds of their Subscribers. However, publishers could also select additional Friend Lists who would receive that update in their news feeds, or compose a separate update for that Friend List. For example, I could build a Friend List of friends who also happened to be very interested in technology news. 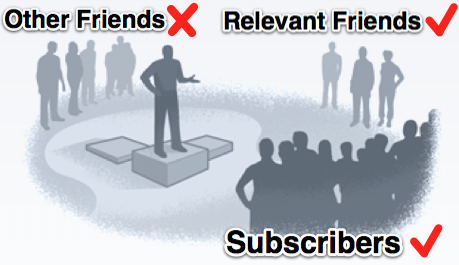 Then when I wanted to publish an article I wrote, I could select the “Subscribers” list and the “Tech News Friends” list (or publish to both separately). The update would be publicly visible on my profile, but I wouldn’t have spammed the news feeds of my non-tech news friends with it. If this solution was implemented, I’d publish a lot more content to my Subscribers. It would allow Facebook to overtake Twitter as the best place to follow public figures. Most importantly, it would improve the user experience by allowing us to share what we want with who we want, without spamming anyone else. What do you think? Join the public discussion on my Facebook profile.